A quick video from our honeymoon in Greece. 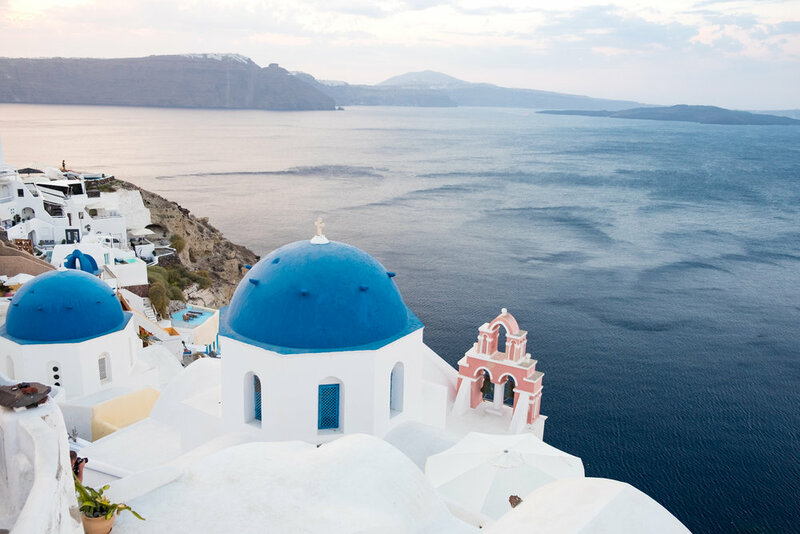 When visiting a place as famous as Oia your expectations are high. And let us tell you it did not disappoint. Tiny white buildings grip to the side of the cliff as it jets down to the deep blue sea. The iconic blue domes stand out among the speckled white city. 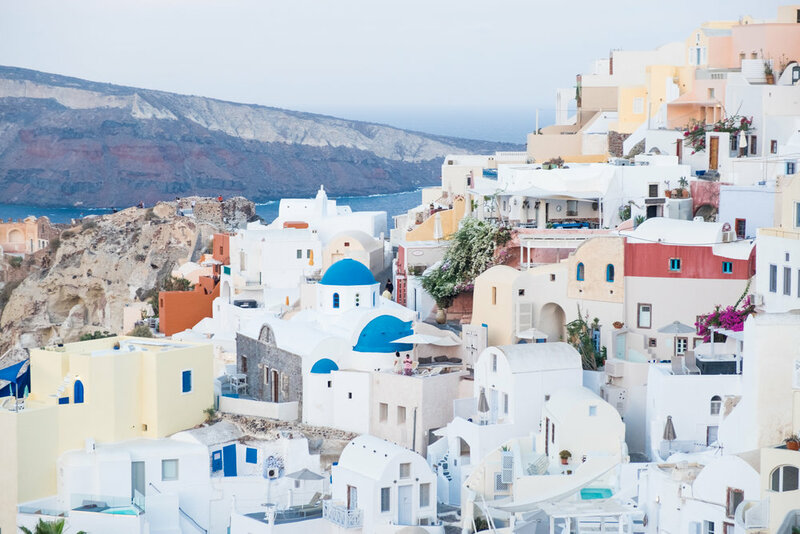 Santorini was everything we imagined and more. After spending a night in Athens we took an early morning flight to Santorini which got us in at 8 in the morning. After we dropped off our bags at our hotel we took off to go explore Oia and grab some coffee. We found the mornings in Oia very peaceful with barely anyone around. Here are some photos from that morning and our first glimpse of Santorini. We spent the next day exploring the little town of Oia which was only a short 5 minute walk from our hotel. The next two mornings our jet lag had us up before the sun. We would start our day walking around the old town taking photos and watching the sun come up. Tip: To beat the crowds wake up for sunrise! You will have about 1-2 hours with the town all to yourself. We love to do this in popular destinations. It gives you an entirely different feel for a place when you are some of the only people wandering the streets. 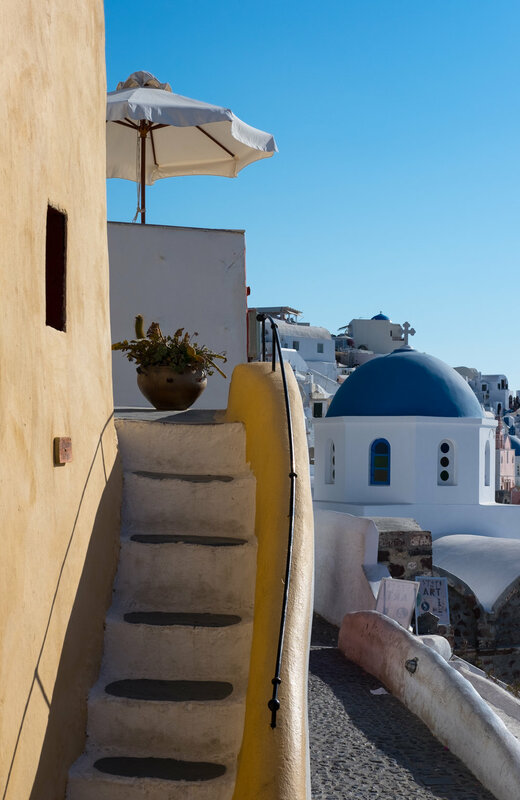 There seems to be something special around every corner in Oia. Make sure to hike up and down the small alleys off the main street. You never know what you will find. Oh Perivolas, how we love you. We chose this hotel to be our honeymoon hotel long ago. 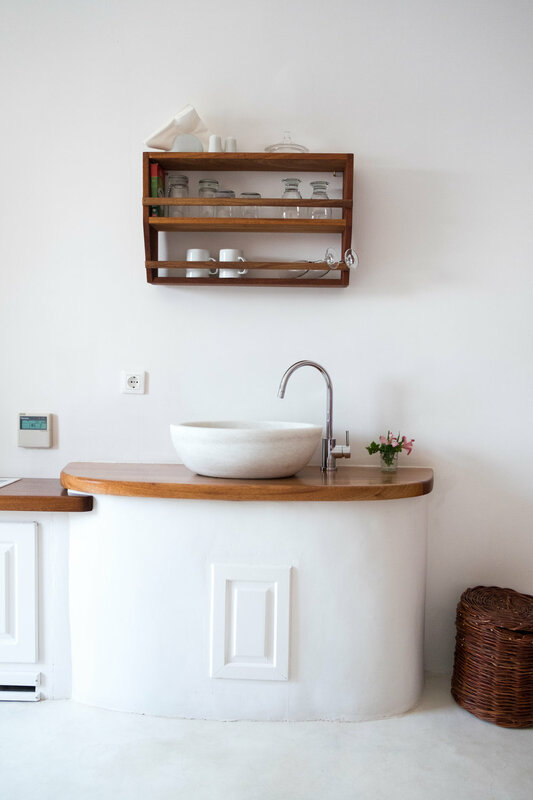 We looked at so many different hotels online for our stay in Santorini but something drew us to Perivolas. 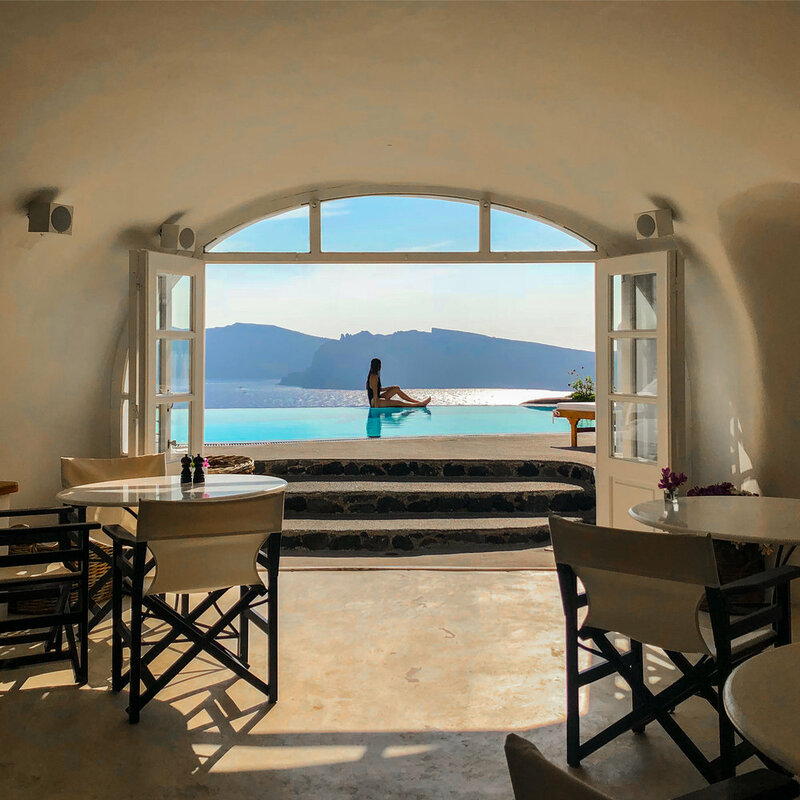 One of the oldest hotels in Oia with one of the most famous infinity pools on the island, Perivolas is luxuriously intimate. We couldn’t have picked a better place to kick off our honeymoon in Greece. There were so many beautiful places to sit back relax and enjoy the view of the Caldera in the distance. The terraced gardens of Perivolas spill down along the cliffside and in the middle of it all lies the most glorious infinity pool of all time. We spent hours swimming in the pool overlooking the sea below. With all the hustle and bustle and crowds in Oia it was so nice to be able to retreat to our hotel and relax. One of the other reasons we picked Perivolas is because of the incredible cave like rooms. This style of building is quintessentially Greek and oh so fun. Being our first stop in Greece it was pretty unreal that we woke up in this cave and walked out to some of the most stunning views of the Aegean Sea below. There is one reason to grab a table at Terpsi and that is the view. Directly on the main street you will find this little place. We came for breakfast and sipped on our cappuccinos while enjoying the most incredible view! Our favorite place to eat in Oia! Pito Gyro had some of the best pork gyro we had the whole trip. This little place is off the main street and down a small alley. Once you find it you will know because you will be able to smell the pork roasting over open coals. The gyros in pita were super affordable for only 4 euros. We came back here every day for lunch. Pork gyro platter (above) and pork roasting over the open coals (below). We thoroughly enjoyed our dinner at 1800 Floga. We made reservations here a couple weeks before we came and were seated up on their terrace deck and were able to watch the sunset from our seats. The food was fresh and inventive, this is a good option if you are looking for a place with a great view for sunset. 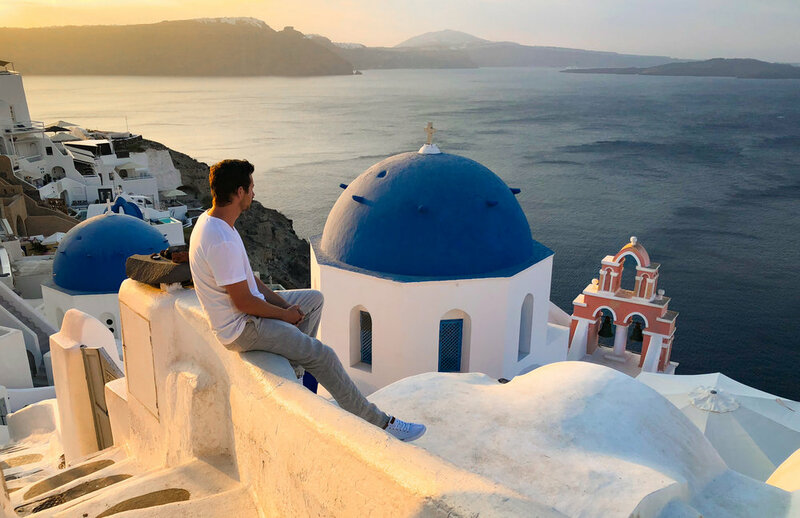 We had the best time relaxing and enjoying beautiful Oia, Santorini. It is just as stunning as you have heard it is and should be on everyone’s bucket list. But do us a favor and visit on your own! Cruise ships and over-tourism are threatening this little slice of paradise and we would love to see it stay the way it is. Until next time Santorini! After only a short ferry ride we arrived on the beautiful desert island of Ios. This island is known as a party island. In the middle of summer the old town is packed with party goers dashing between the dozens of clubs that are hidden in the alleys of old town. But we visited in September when most students are back in school and found a completely different vibe. The weather was still hot, the ocean was warm, and the beaches and bars were nearly completely empty. We were looking for a relaxing time filled with some adventure and we found it all here in Ios. The ferry from Oia dropped us off in the Port which was super cute and a perfect first glimpse of Ios. We headed to our hotel to check in and then took off to explore the Chora, or Old Village. We immediately fell in love. One of the best things about Ios is this beautiful old part of town. The white striped alleyways are like a maze, that wind you along past all of the bars, restaurants and shops. This is a pedestrian only area so you can really slow down and enjoy as you walk along. The walking street on the way from our hotel to the Chora. Some of the furry faces we saw exploring the Chora. The white alleyways that wind through the old town. The entire Chora sits along this hill (look at the photo above) and you can walk to the top where the church is for one of the best views of the harbor. 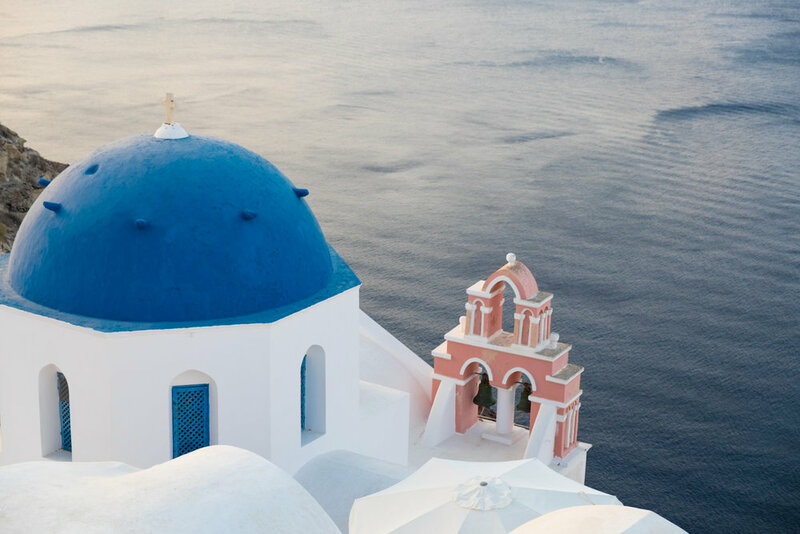 Blue domes aren’t just in Santorini, throughout all the Greek Islands you can see blue domed churches. The church on top of the hill. One of the things that separates Ios from the other Greek island is the pristine beaches and the clarity of the water. Being from Lake Tahoe which is home to one of the clearest bodies of water in the world we have high expectations for water clarity and we were blown away by the gin clear water of Ios. Check out the photo below! The most beautifully clear water we’ve ever seen. These smooth white stones could be found all along the coastline. Two of our favorite beaches were Agia Theodoti and Magganari. Both of these beaches were off the beaten track and had stunning white sand beaches with barely another soul in site. It was an incredible feeling having some of these beaches all to ourselves. The best way to explore the island! We rented a car for two days and were able to see the entire island. We opted for a 4X4 vehicle because some of the beaches are only accessible via dirt roads. Our little jeep was a convertible and we had a blast cruising it around the island. If you drive around the island for long enough you are bound to run into this herd of goats. They roam the island like they own the place, stopping traffic and headbutting each other whenever they like. Beautiful churches around every turn. 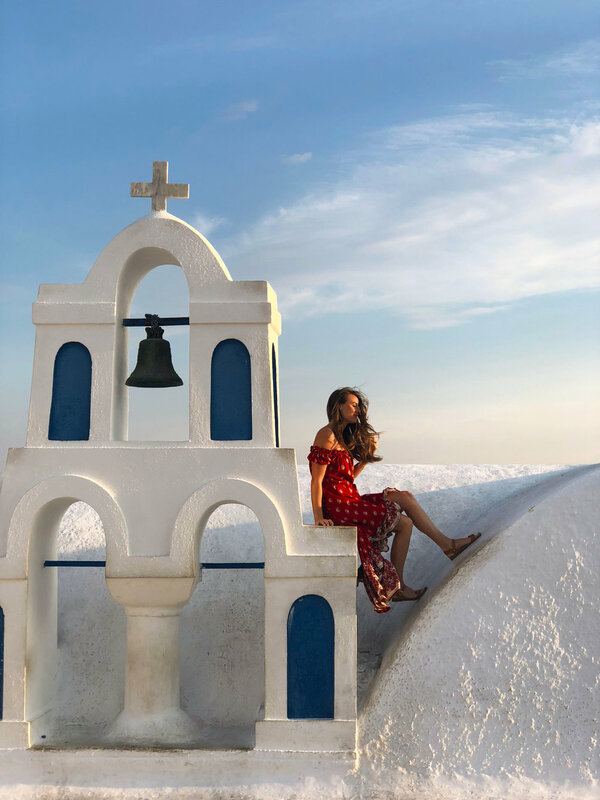 We found the most incredible spot to watch the sunset over the Chora. There is a little hill across from the town that has a church and a couple windmills on it. We drove our jeep up this hill and were completely alone up there and had the most magnificent view of the city perched on the hill and the ocean behind it! We were able to fly the drone, drink some wine, and watch the sun as it dipped into the ocean and disappeared. One of the most memorable sunsets from our trip. We could not have been happier with our choice to stay at Liostasi Hotel & Suites while in Ios. With a perfect location; Liostasi is only a short walk from town but feels secluded because of it’s position on the cliff side. This chic hotel is immaculately designed, every detail flows from the pool, to the bar, to the restaurant. We were treated like royalty upon arrival with a welcome drink in hand we were told of the various spa options and the incredible chefs offerings and tasting menus. The perfect place to watch the sunset, at the Pool Bar and boho seating area overlooking the bay. Even if you aren’t staying at Liostasi you should definitely come to their pool bar for a drink. We were stoked on the craft cocktail menu here. We especially loved the entire page dedicated to unique gin and tonics. We had some amazing cocktails from this bar and the setting and lounge area was super cute. The perfect place to watch sunset, overlooking the bay. The breakfast buffet at Liostasi was one of the best we’ve ever had. With a focus on traditional Greek dishes with local ingredients this buffet was really authentic and offered a variety of hot dishes as well as the cold buffet. We looked forward to it every morning. 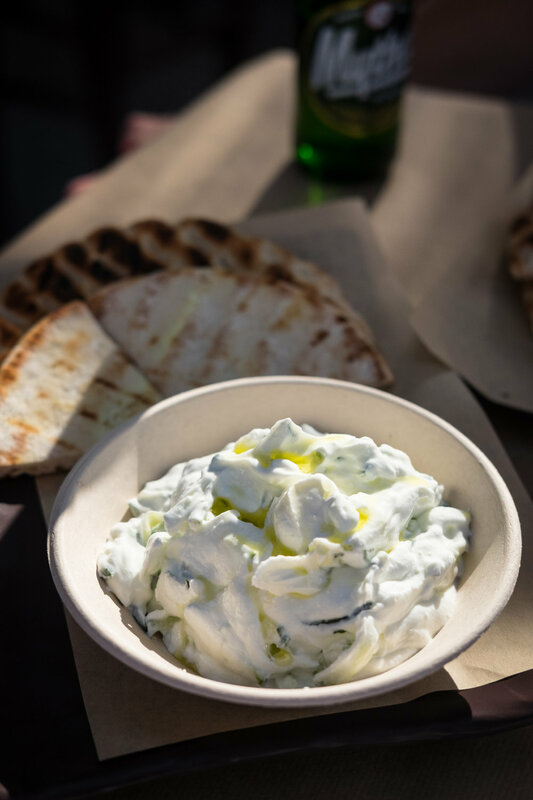 Some of our favorites: thick Greek yogurt with dried fruit and local honey, homemade jams, daily pie, bruchetta with local cheese, eggs in cast iron, and traditional benedict. This tiny roadside taverna is not in the main area of town. We stumbled across it while we were riding around in our jeep. As we drove by this place and randomly smelled whatever they were cooking we knew we needed to eat there. It ended up being one of the best meals we had on the entire trip. 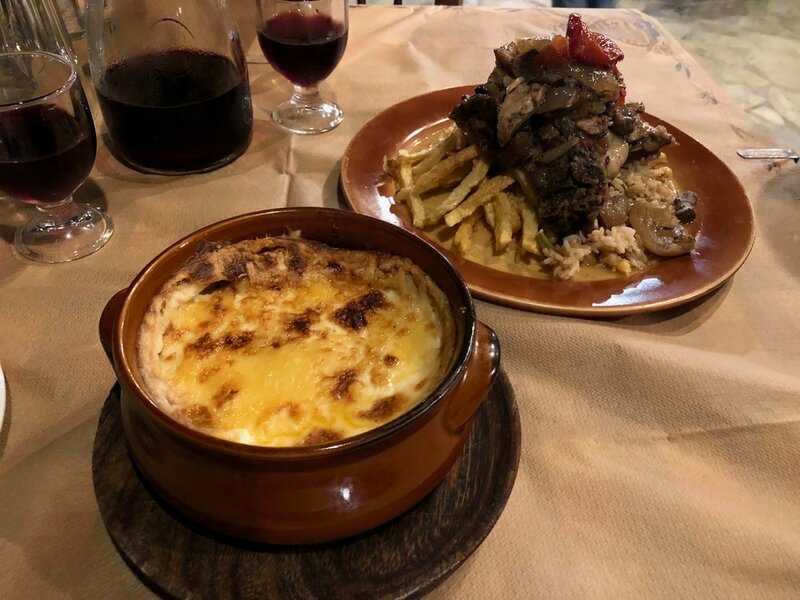 We had traditional mousakka, slow roasted lamb, and a 3 euro carafe of house wine. But the highlight was this block of creamy feta crusted in sesame/flax seeds, heated up and then drizzeled with honey and balsamic (photo above.) This dish was so delicious we came back the next day at lunch to order it again! Nothing beats a full liter of house wine for 3 euros. Another roadside find. 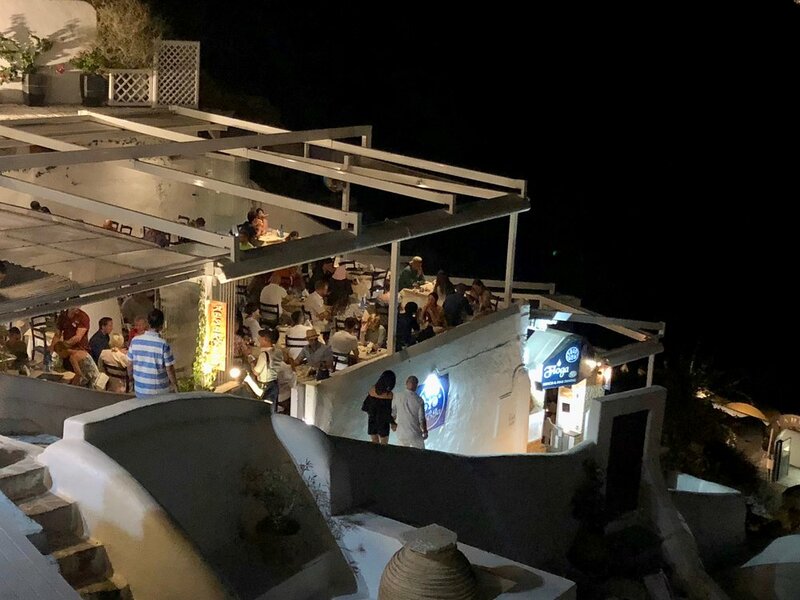 This family run restaurant is perched onto of the hill overlooking Agia Theodoti Beach. Our lunch was super fresh and traditional with local ingredients. We had the best time visiting this tiny island in the Aegean with some of the clearest waters we’ve ever seen. We would love to come back and visit Ios someday. Around every corner of Naoussa is adorned with cute chapels and lovely churches but the Church of Assumption on top of the hill is stunning and has a great view from its steps of the port and city below. One of the most special areas on this island is the old fishing port in the town of Naoussa. This little harbor is tightly packed with traditional Greek fishing boats and is surrounded on all sides by restaurants and bars. This quaint old port is the heart of Naoussa and all of the winding alleyways of the town will eventually lead you here. In the summer this port can be packed with toursits but when we visited in Early September it was fairly quiet. We felt like we were in a postcard as we walked around the old port and saw freshly caught octopus hanging on the fishing boats, drying in the sun. Some of the colorful buildings and restaurants in the port were literally sitting on the sea; with the waves only inches below your toes. 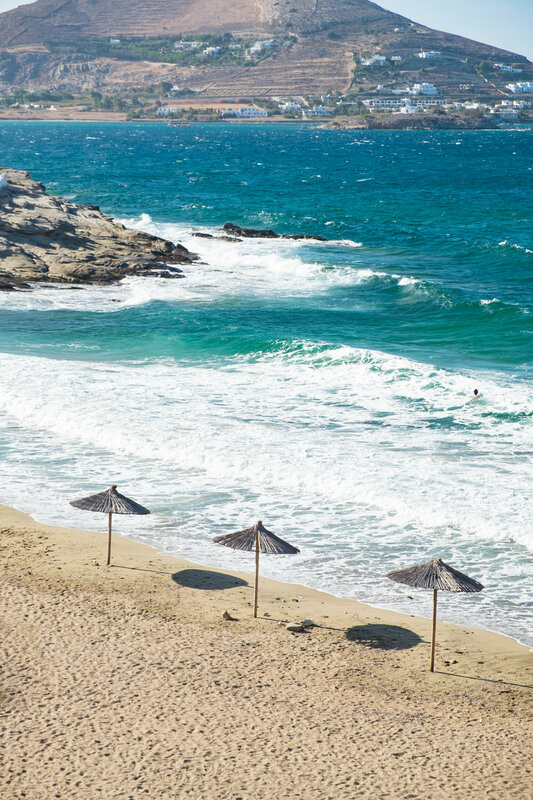 Besides the charming old town and port, Paros is home to some lovely beaches. Molos Beach was located right down the stairs from our hotel. It had a sandy bottom and a fun wave break. 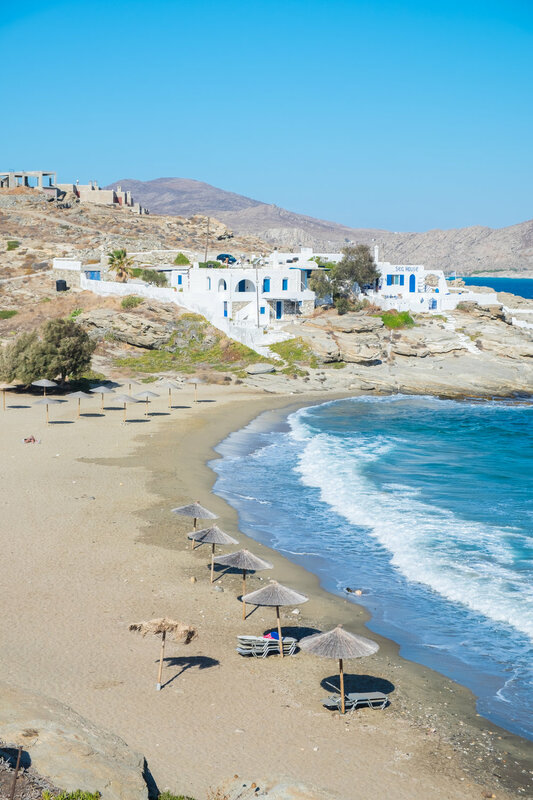 Kolymbithres beach, which is only a short drive from Naoussa is perhaps the most famous beach in Paros. Its known for the large granite rocks that have been carved down by the sea over time into strange smooth shapes. If you are lucky you can find your own private bay or pool for the day. We stayed at the Senia Hotel loctated only a couple minutes walk to the old town and directly above Molos Beach. We chose it because of the amazing pool with views of the ocean and islands in the distance. Although the rooms were a little outdated we enjoyed our stay at Senia Hotel. The pool and fantastic staff more than made up for it. 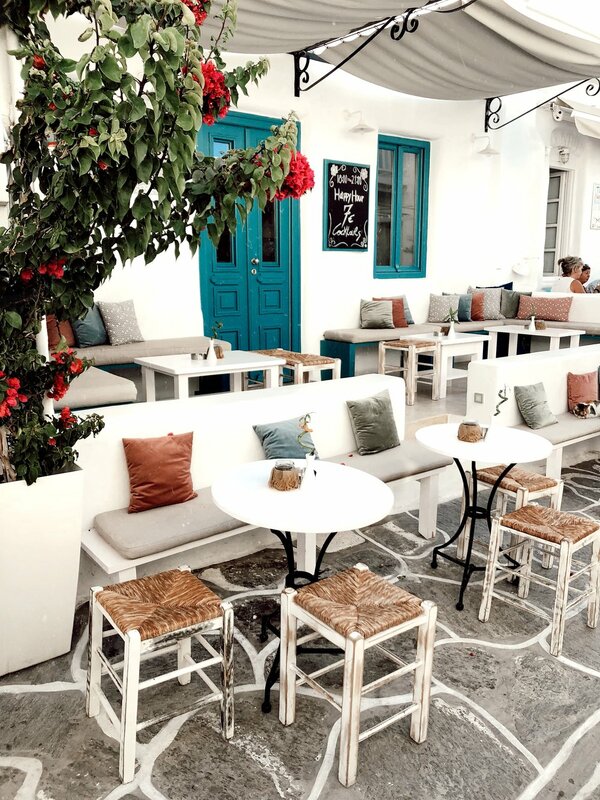 Our favorite restaurant in Paros. 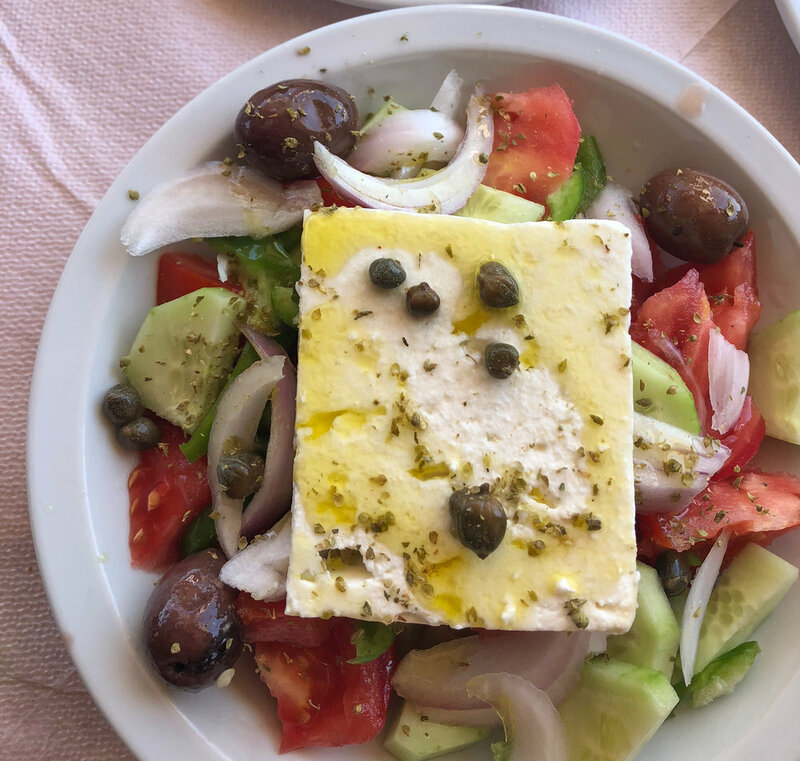 We luckily decided upon Safran for dinner our first night in Paros and after the fantastic meal we had we chose to come back again the next night. 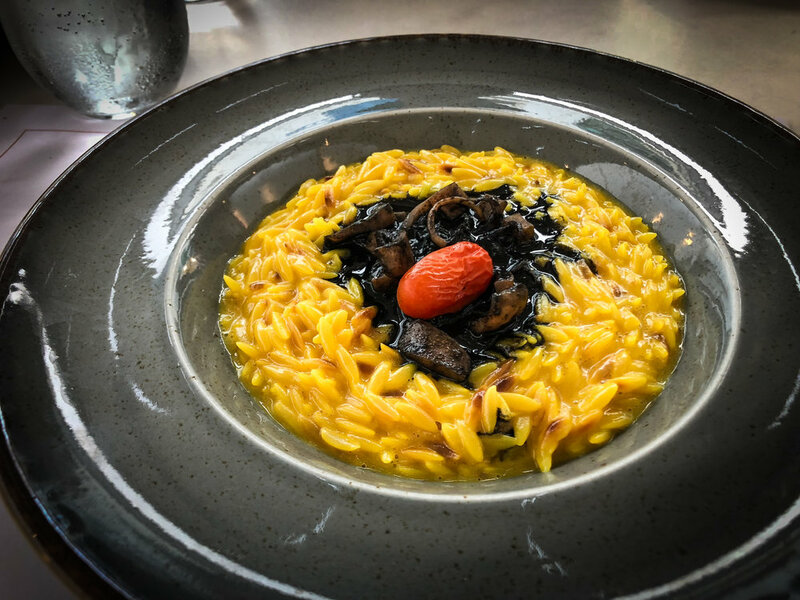 Both meals were equally delcious but the orzo with black squid ink was one of the best meals of our entire trip. Orzo with black squid ink. Authentic Italian gelato right on the promenade. This shop is a tiny hole in the wall but has over 30 delicious flavors and is owned by the nicest Italian lady. Try the pistachio! We found that some of the best food we had in Greece was at the gyro stalls hidden within the towns. These no-name little spots would serve up tasty gyros with roasted meat wrapped in a pita with tzasiki and fries. These gyros were only 2-4 euros and could fill you up all day! At night the streets are filled with people sitting outside and eating dinner or enjoying a glass of wine. The charming streets are lit up by candles and lights which bounce off the whitewashed walls. Be sure to grab a drink outside and take it all in. Considering a night cap? Head to San Fos in the old port. This half indoor and half outdoor bar is right next to the water and has a great bar program. The bartender was really knowledgeable about his cocktails and made us one mean Negroni. View of the port from the bar. Inside the tiny San Fos bar on the port. Paros was a dream! 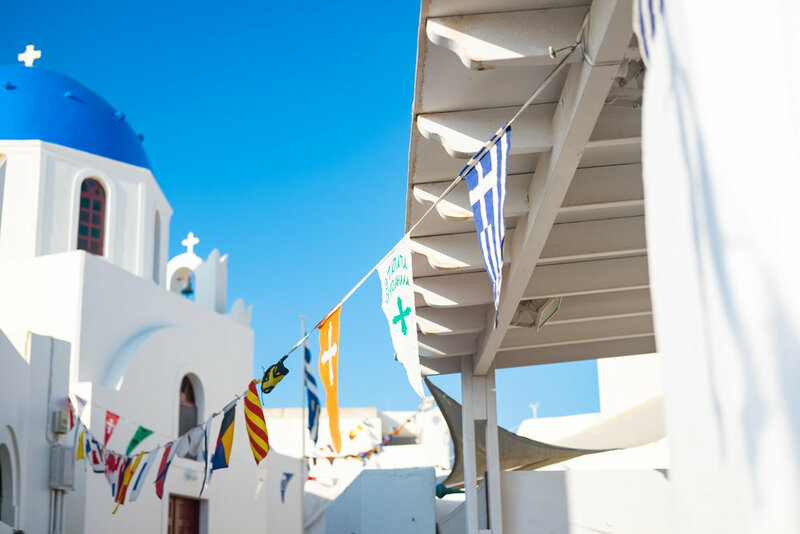 We didn’t know what to expect during our visit to Paros and we have to say it completely exceeded our expectations. The old town and port were something out of a fairytale. 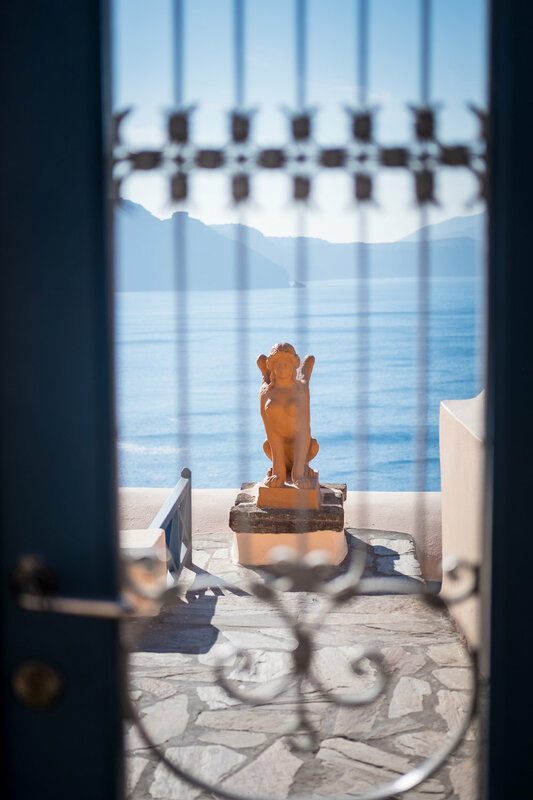 We are already talking about when we should come back to this charming island in the Aegean! The last stop in the Greek Islands. 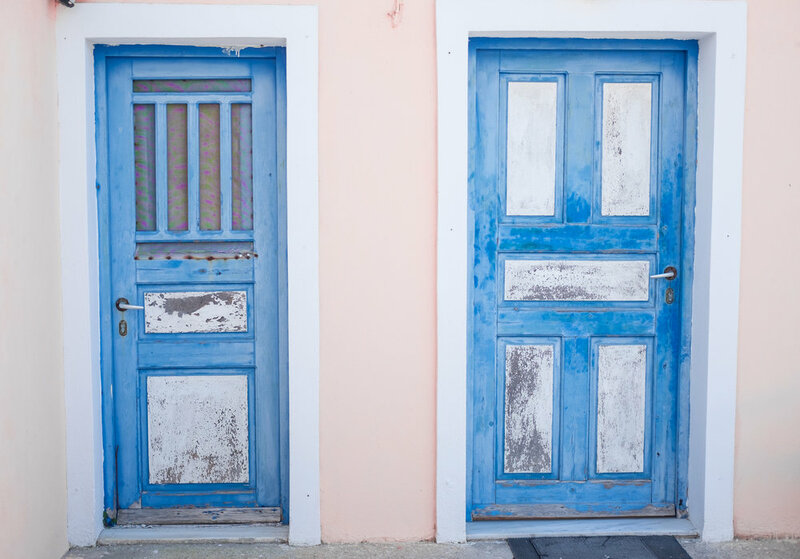 We spent 3 days soaking up the last bit of summer sunshine in beautiful Mykonos. 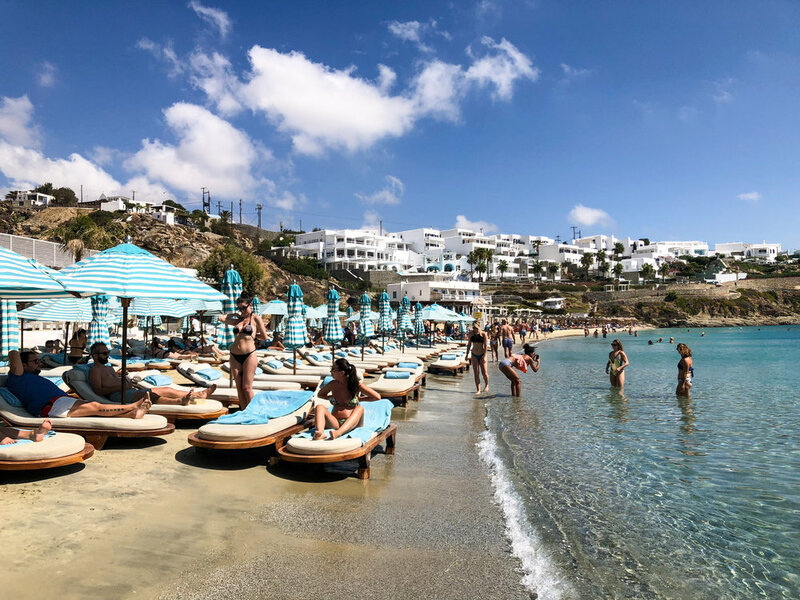 This island has never been a secret and is a favorite summer destination for jet-setters who love to party until sunrise and indulge in everything Mykonos has to offer. 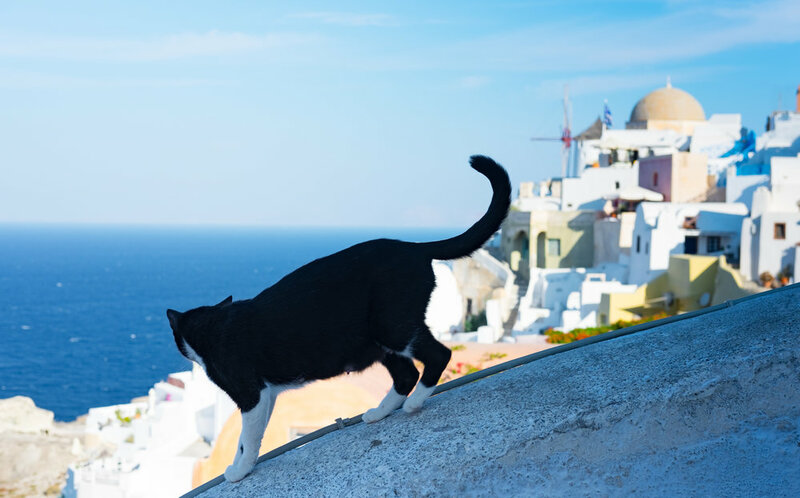 Although it’s reputation precedes itself, there is something for everyone in Mykonos Town. 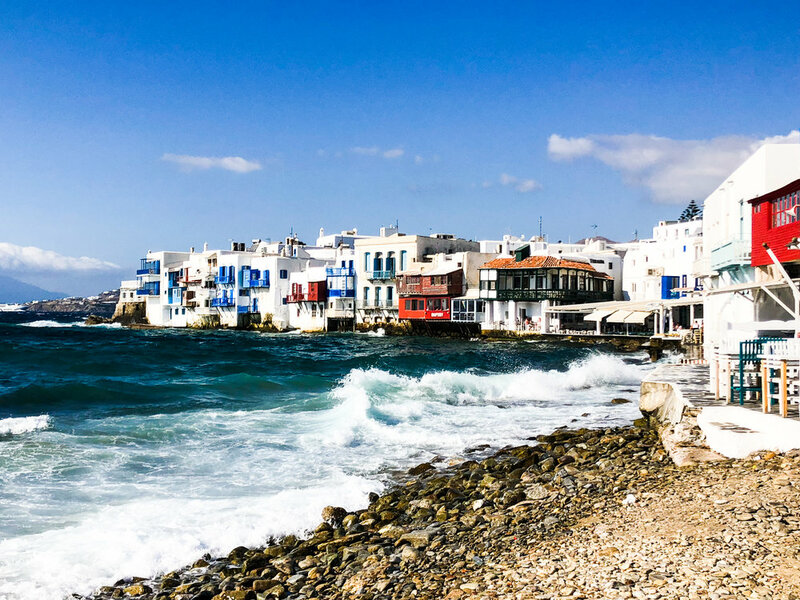 As picturesque as a postcard, the old town and Little Venice area of Mykonos are what makes this island so special. 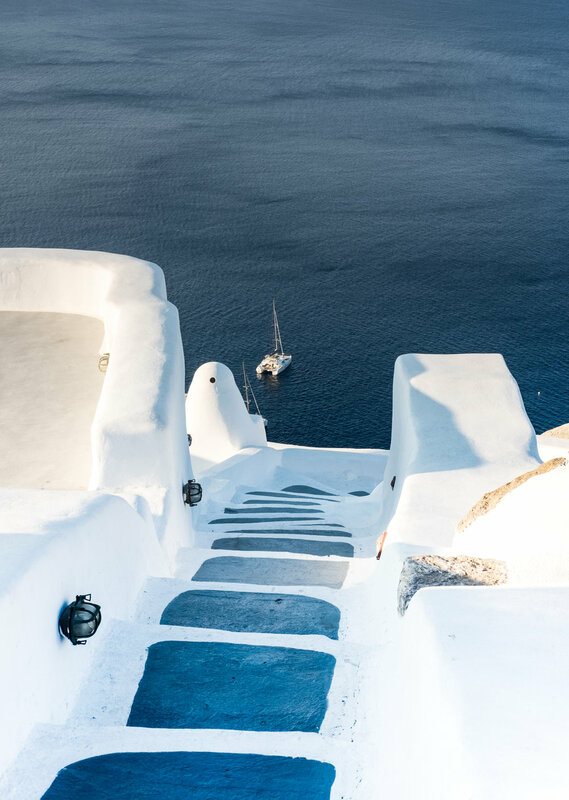 Besides the white stone pathways and quaint alleys the beaches of Mykonos are just as stunning. The water was crystal clear and pristine, the water quality around this islands is worth the trip alone. Oh Scorpios, how we love thee. 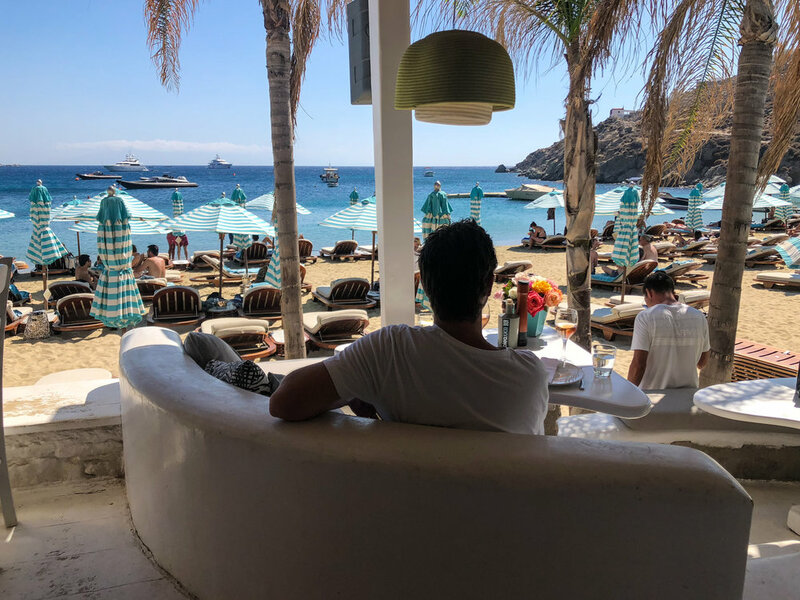 One of the best places we visited in Mykonos was Scorpios. This secluded beach club is atop the rocky cliff side overlooking the ocean is a dream. The bohemian decor made us think of Tulum. At sunset everyone at Scorpios is ready to listen to some live music, sip exotic cocktails, and dance with their toes in the sand. We made a reservation to eat dinner at Scorpios for sunset and the food was fresh, local and delicious. After dinner we danced as the DJ pulled out his guitar and started to sing along with the beats. We spent a day at one of the most famous beach clubs in Greece and possibly the world, Nammos. This premiere beach club is exquisitely located on the marvelous sandy beach of Psarou. This world-renowned hot spot is no stranger to the rich and famous. The services is impeccable and it doesn’t hurt that the servers are all models in bikinis. Two beach chairs and an umbrella for the day will set you back $150 euros. We decided to splurge since we were on our Honeymoon and thought our day spent at Nammos was worth every penny. 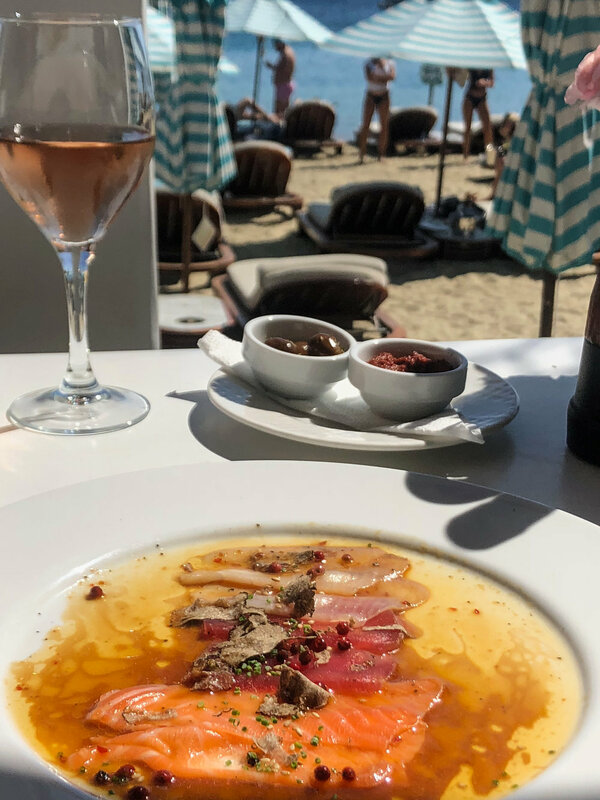 Besides a fun beach area; Nammos Restaurant is divine! The sushi is as fresh as it gets and our lunch was amazing. This small traditional Greek bakery was a great find! 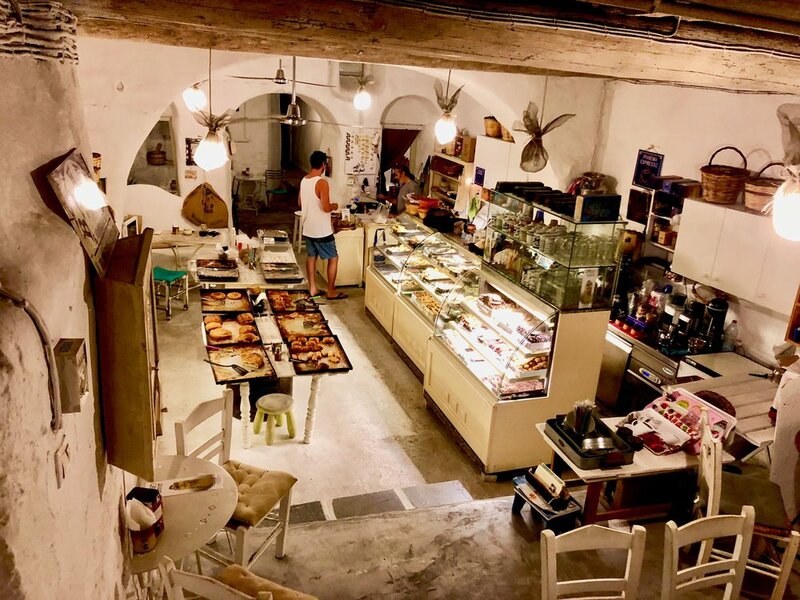 The entrance is somewhat hidden next to some stairs but once you climb down into the little space you will find a vast array of freshly baked pastries and breads. The older man working there didn’t speak any English but had a huge smile on his face while we picked out our treats. Try the honey balls, they are a Greek specialty and were delicious! The bakery entrance hidden behind the stairs. 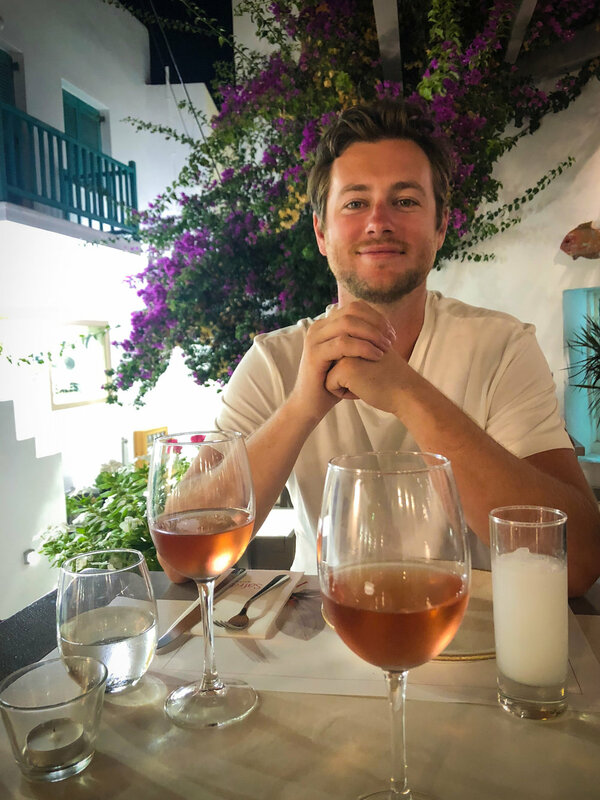 Greece has definitely been a special place for us and we would recommend Greece for anyone looking for an amazing honeymoon location. 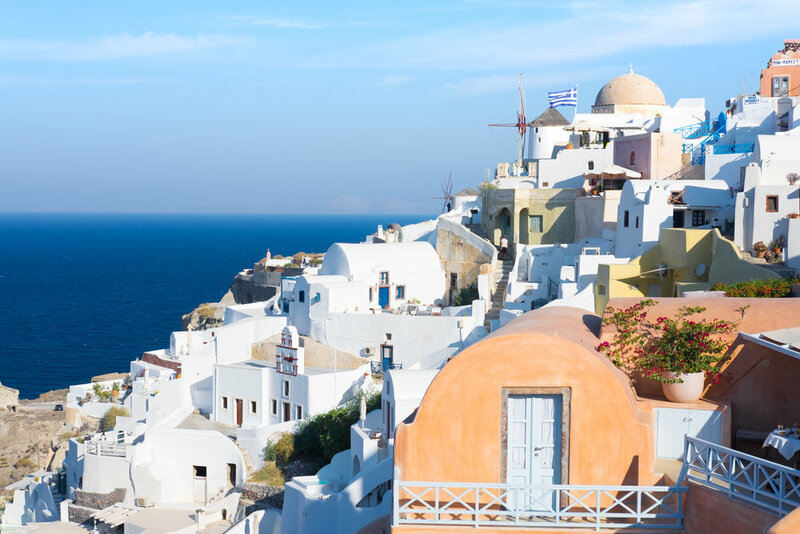 The charming white washed cities, fresh simple food, alleyways, and beaches stole our hearts. We only visited 4 of the many islands in Greece and can’t wait to come back and see more of what this beautiful country has to offer.